this is a bit of a bright one isn't it? sometimes i'm just in that mood. 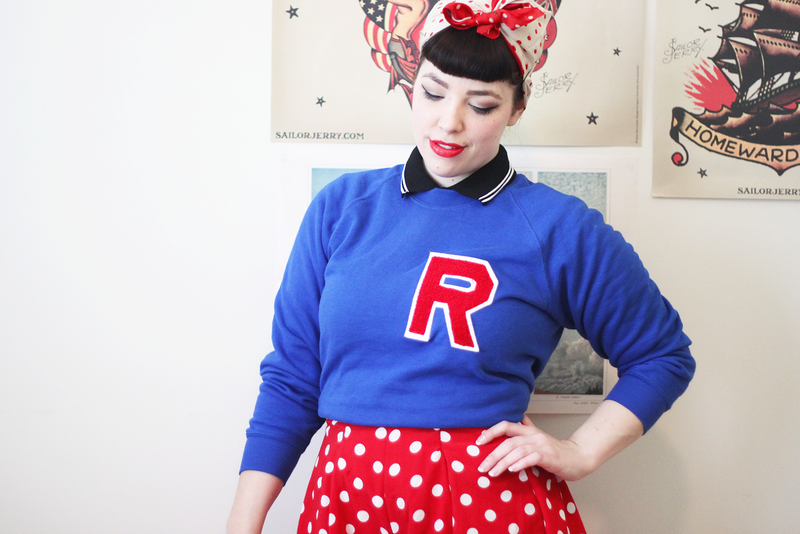 i didn't realise until after i'd left the house but i kind of (unintentionally) look like a cheerleader so i'm going to pretend the meaningless R on my jumper stands for rydell high. i actually thought the shorts were a skirt when i bought them. it was at a market stall with no changeroom so i just had to buy them on the spot and when i tried them on later i didn't understand what i was doing wrong when i couldn't fit myself into one of the legs, and then it dawned on me! luckily i think they're awesome as shorts and they're definitely one of the more unique things i own. Show your spirit girl! Sometimes a bright color mood bites you and you just have to go for it! You always look so cuteee!!! I love these photos - your bright outfit makes me smile! Your outfit is perfect - I actually love that those are shorts! It means you don't have to worry when the wind blows, haha. I've actually had an eye out for skirtish shorts (skorts?)/culottes. haha that's the best bit about them! i can walk around freely without worrying about my skirt blowing up which is a constant problem on every other day for me. 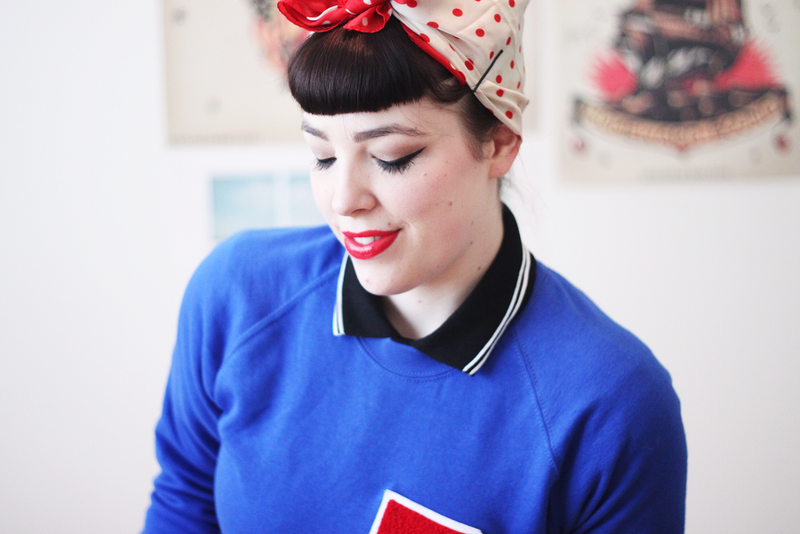 Your jumper is so cool,it looks so vintage! OMG so beautiful! And the shorts are amazing; actualy I thought they were a skirt too at the begining, and I was searching on the pictures like 'What shorts, girl?' hahaha!! I love how you used the scarf on your hair, looks so beautiful... and your make up; simply perfect!! Love this! 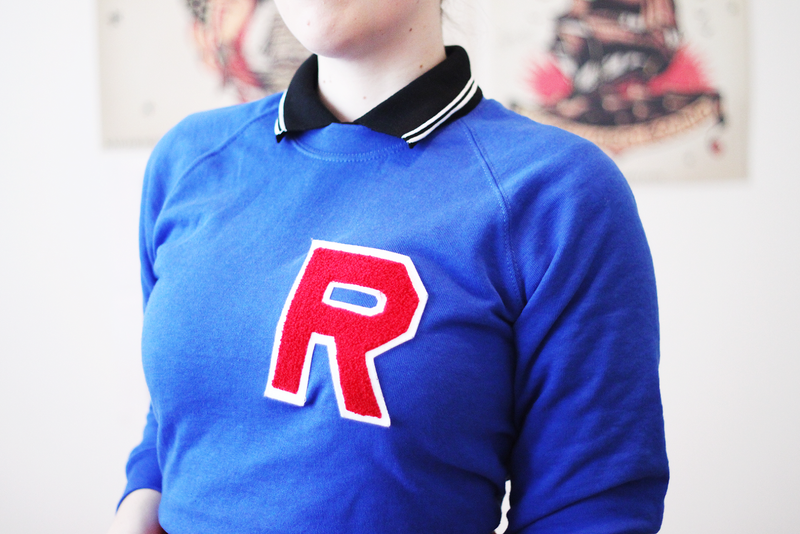 I instantly thought of Rydell High when I saw the R. Haha! Such a cute and unique outfit! You're gorgeous! Those shorts are fantastic! love out they match with your jumper! You are gorgeous, and I'm loving this outfit! You do look a little like a cheerleader (reminds me of the movie Grease), but you look so adorable and lovely. You have such a great eye! Luuurve. so cute! love your sweater! and yes, culottes can be tricky but so much fun. You're such a gorgeous human being. Your outfit is great and you pull it off wonderfully. Next to you I'm a plain old hag in my clothes haha! Oh my word, do I adore this punchy, fabulous outfit! 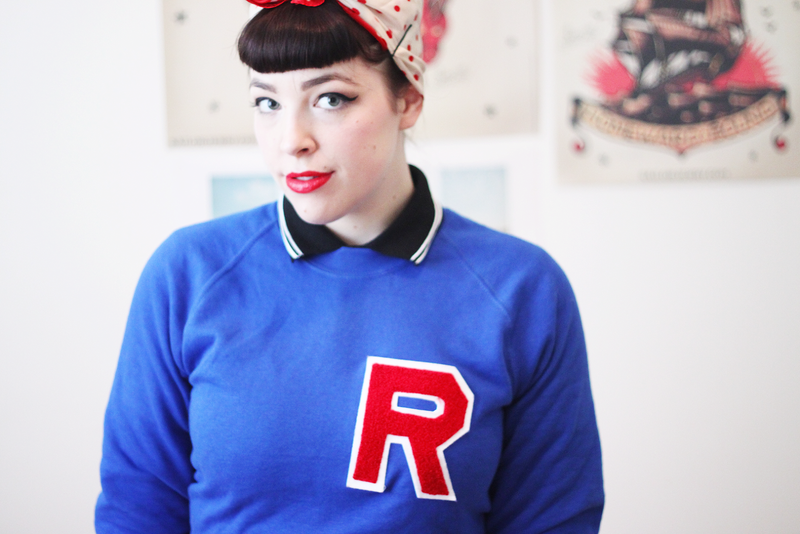 A vintage school letter sweater (and/or jacket) is high up on my wish list, and seeing you in this one just makes me yearn for one all the more. I've always hoped to find one to partner with a coordinating circle skirt for a 1950s cheerleader look. Have a gorgeous July, dear gal! soooo 50s! I am definitely loving this look! :) It's so vintage. It reminds me of these old films that I'm watching. This outfit is amazing. 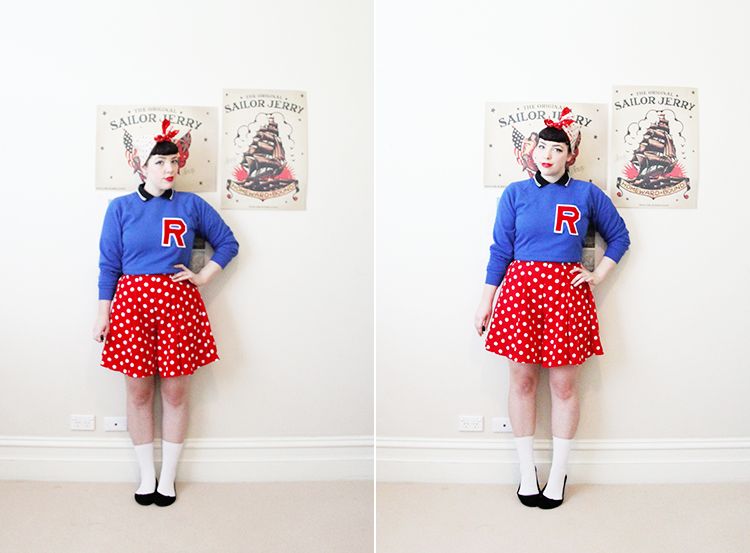 You really nailed the vintage cheerleader vibe and the colors work perfectly on your skin tone. Also your hair is adorable. Love!!! OH.MY.GOODNESS!!!! Best outfit I've seen all day trolling the interwebs! You look fantastically cute!! I adore this outfit, you look gorgeous! You'd be the coolest cheerleader in Rydell, that's for sure! This would also made a terrific fourth of july outfit in the states as well! Hope you're having a wonderful day! You're such a stylish thing! I usually play it safe with black, white or burgundy when it comes to clothes, although I did buy an amazing pair of colourful pants in Topshop today that I'm absolutely in love with. 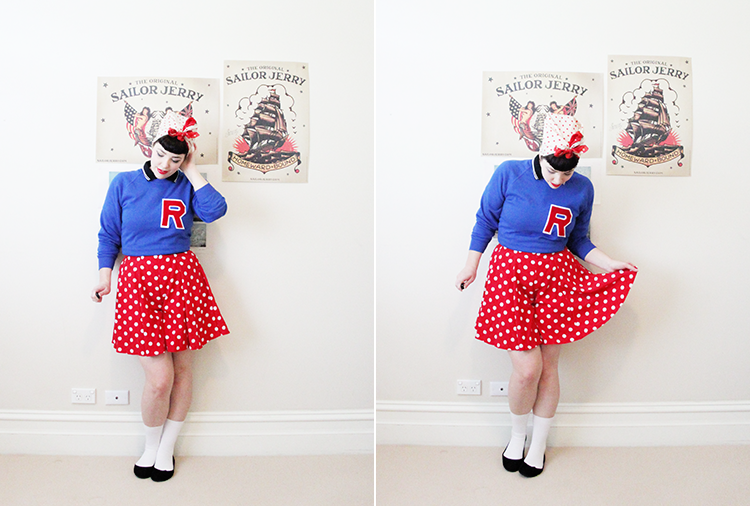 I love the whole 1950s/retro cheerleader vibe going on here. You could be a character right out of Grease! Love the outfit! I also own polkadot pants that looks like a skirt. Very comfortable! Great discovery your blog and your style! They look more gorgeous and original as shorts than as a skirt! you should do a tutorial for that head scarf up do! you look fabulous.